Sports TV coverage is now broader and more extensive than ever. Whether it’s Premier League football, Formula 1, Rugby Union or something with less mass market appeal that you’re into, you’ll be able to find a huge range of channels providing in-depth coverage. Better still, the explosion of digital channels means there’s also more live sport from around the world for you to enjoy. Traditional terrestrial broadcasters — such as the BBC, ITV and Channel 4 — still hold the rights to some of the UK’s crown jewels sports events. The BBC’s line-up, for instance, typically takes in Premier League highlights via Match of the Day, major European international football tournaments and friendlies, Six Nations rugby, the Olympics and the Grand National, as well as a host of minority sports. However, dedicated sports channels offer much more coverage of a wider variety of sports. Here we outline the main subscription sports broadcasters with channels aimed at committed sports fans and intended to get you even closer to the action. What does Sky Sports show? Sky Sports is perhaps the leading subscription sports broadcaster with 10 dedicated channels. If you want to see live Premier League matches, EFL games, Major golf, England Test cricket or extensive Formula 1 racing, Sky is the place to be. In case that isn’t enough sport for you, Sky customers can also add channels dedicated to single teams such as MUTV for Manchester United or Chelsea TV for Chelsea football club. Learn more about Sky Sports in our Sky Sports guide. Although a relative latecomer to the scene, BT Sport has an impressive number of exclusives, including live Premier League matches, UEFA Champions League games, Serie A and the Aviva Premiership. BT Sport encompasses four channels: BT Sports 1, 2 and 3, and BT Sport ESPN. Depending upon your package, you can watch these channels in HD and even UHD, or 4K, if your TV is compatible. Read more about BT Sport in our BT Sport guide. Do I have to be a subscriber to get access? Both Sky and BT let subscribers from other providers get access to their content — for a cost. 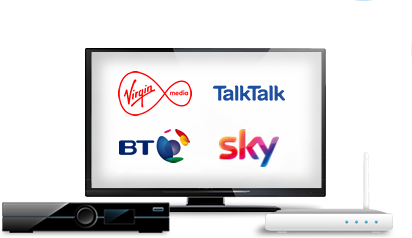 Almost all providers offer a Sky Sports or BT Sports bundle of some sort that you should be able to add on for a monthly fee. Not sure which is right for you? Check out our guide on BT Sport vs Sky Sports.